Patrick Hull, 24, who was serving a seven-year prison term for a drunk-driving accident that claimed the life of a young Lima woman last year, was back in court Tuesday. To a judicial error that occurred during the initial sentencing hearing, Hull was re-sentenced to six years in prison for his role in the fatal crash. LIMA — A man currently serving a seven-year prison sentence for a 2017 drunk-driving accident that claimed the life of a young Lima woman was back in court Tuesday to correct a judicial error. As a result of that error and other factors, one year was trimmed off his sentence. 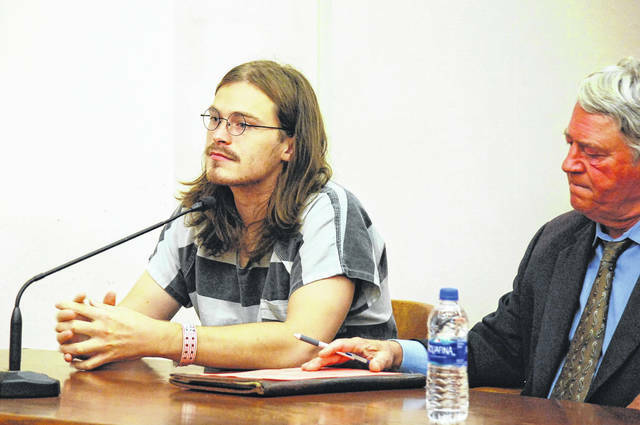 Patrick Hull, 24, was sentenced March 19 in Allen County Common Pleas Court after pleading no contest to a second-degree charge of aggravated vehicular homicide for causing the death of Holly Mooney, 23, of Lima. At that time Judge Jeffrey Reed sentenced Hull to seven years in prison, with the acknowledgement that Hull would be eligible to request judicial release after serving five years in prison. As it turns out, the judge’s interpretation of state sentencing guidelines was incorrect. With Hull back in the courtroom Tuesday, Reed apologized for a “major mistake made by the court” during Hull’s sentencing hearing. The judge noted that under Ohio law the offense for which Hull was found guilty required a mandatory prison sentence be imposed with no possibility for early release. “I accept responsibility for that error and I apologize to the victim’s family and to the defendant,” Reed said. Reed said there were two options for Hull to consider to correct the oversight. One option is that the defendant could withdraw his no contest plea “and at that point we basically go back to square one” in the plea negotiation process. The other option was that Hull agree to plead no contest once again “and we do the sentencing hearing all over again,” the judge said. Hull chose the latter option. Prior to being sentenced a second time, the mother of Holly Mooney asked Reed to be lenient. “I was fine with (Hull) having a lesser sentence,” the woman said. Hull’s attorney, John Fisher, said his client has enrolled in college classes during his seven months in prison and is attempting to turn his life around. He then sentenced Hull to a mandatory term of six years in prison. Prosecutors say Hull was operating his vehicle on Bluelick Road on Aug. 5, 2017, with a blood alcohol level of .16 percent when the car left the roadway, struck a utility pole and overturned several times. Mooney, a passenger in Hull’s vehicle, died three days later of injuries sustained in that accident. Hull was indicted by a local grand jury on one count of aggravated vehicular homicide, a first-degree felony, and three counts of operating a vehicle under the influence of alcohol and subsequently accepted a plea deal from prosecutors by pleading no contest to an amended charge.